A metallic black creature slowly ambles across the ground, resembling a small, plump olive. Its domed, iridescent carapace gleams blue in the sun, and it waves an antenna curiously. This common leaf beetle is in search for bedstraws, Galium, (identifiable by a square-shaped stem) on which to lay its eggs. These will serve as the food plant for its monophagous blue-black larvae, which pupate over winter. The elytra (wing cases) in this species are fused, meaning it is flightless. The adults emerge in April and can be seen until July along hedgerows, in grassland, and on coastal paths. 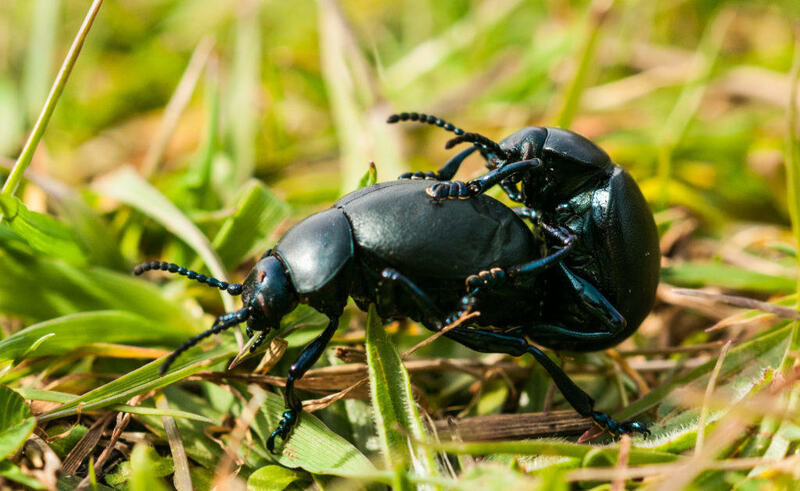 The Bloody-nosed Beetle gets its fantastic name from its unusual defensive behavior. When threatened, this insect exudes droplets of haemolymph, a red-orange liquid, by breaking membranes in its mouth. Haemolymph, which is analogous to human blood, is foul-tasting to predators and acts as a visual deterrent, therefore saving the beetle from becoming lunch.